Today I was inspired by a pumpkin bread pudding creation from smittenkitchen.com. It’s the perfect, super-easy dessert to make for your next dinner party. 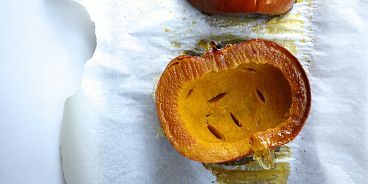 And of course, it’s oh-so-festive with its sweet spices and freshly roasted pumpkin. Go above and beyond by serving this fall dessert with a generous scoop of Rain or Shine Vanilla Ice Cream.